Enterprise Ireland and FlowForma® the leading provider of Process Automation tools for Microsoft Office 365®, are delighted to invite technology, digital transformation and process professionals to an interactive breakfast briefing taking place in The Consulate General of Ireland, New York on April 9, 2019. Discussions throughout the morning will focus on automation, visibility and enterprise mobility within the construction, energy, engineering and utilities sectors. Attendees will learn first-hand, through use cases and examples, how FlowForma customers are benefiting from automating their internal business processes by utilizing the award winning no code FlowForma Process Automation tool. 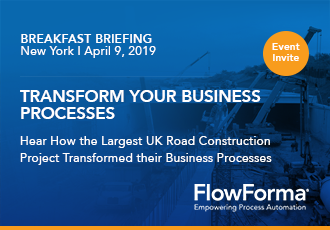 Additionally, attendees will also hear how the largest road construction project in the UK, transformed their business processes, saving them days of effort all while improving visibility, governance and enterprise mobility. “We are delighted to welcome no code process automation experts FlowForma along with enthusiasts and process analysts from the construction, energy, engineering and utilities sectors to this upcoming event here in New York City on April 9. 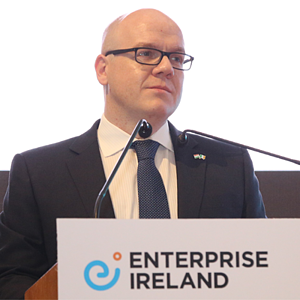 The topic of Low-Code Process Automation has become an increasingly hot topic within these industries, and we look forward to an interesting discussion and sharing of knowledge,” commented Rory Power, Senior Vice President - New York, Enterprise Ireland. Discuss your process challenges and discover how they can be transformed with process automation. Learn how the A14 JV is automating documentation, while centralising and standardising data across projects. Hear how the A14 JV rapidly deployed multiple processes, and increased efficiency and governance with a full audit trail. Experience how our customers are using no code technology to accelerate digital transformation. Who: IT decision makers, digital transformation enthusiasts, process analysts etc. in the construction, energy, engineering and utilities sectors. This event is free to attend but registration is compulsory, secure your complementary place today.